Reaper competes with the likes of Cubase and Sonar and is an advanced audio recording and editing application that also includes basic midi support and a midi roll editor. Development is at a rapid pace, and feedback is often worked on and responded to rapidly. It supports both VST and DirectX effects and instruments with support for an unlimited amount of audio tracks, with each one offering pitch-shifting and time-stretching capabilities. The interface is also clean, with access to the advanced features being pretty simple. 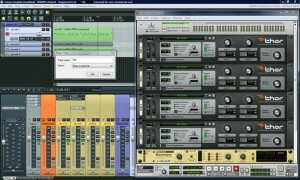 I love Reaper – much easier to use than Cubase, Logic, and Sonar!